To say that I'm more than a little disappointed in the History Channel show would be an understatement. I'll leave it to Ron to post a full article about it though. For those who do buy into what the show has to say Mr. Brewer has given you plenty of clues to start working it. First request your own copy of the cemetery map. Freeze frame the portion of the show where he had his template layed out on it. Use this to make your own exact copy of the template, holes and all. It's easy to do with all the reference points the template laying on the map will give you. Use the gazebo as the center of the layout. You might want to get some old topo maps from at least an 18 mile area around the cemetery. Start matching up the template points. Bob said 99.8% of the points won't have any money though. This is another heads up for our readers. Once again the History Channel is tackling the big question, did the Confederates have any money left over at the end of the war and if so, what happened to it? Did it become part of a mega-money KGC vault? (It really is hard to say that with a straight face you know.) Did the Confederate forces hide it themselves? Was it paid out to the people the South owed at the time? Did the Union forces steal it and hide it or did it even ever exist? This Thursday at 9:00 p.m. central time you may at least get some of the answers. Brad Meltzer's Decoded is going to take on the investigation of this myth/conspiracy/rumor/possibility to see what they can find. I hate to keep giving the History Channel free advertisement but this show has captured my attention. Maybe they are trying to make up for that debacle of a treasure show they aired about Jesse James and the KGC. The team of people on "Decoded" investigate the conspiracy theories of our history and they do so in a logical and straight forward manner. They don't always have a complete answer by the end of the show but they do seem to ask the right questions and come to a logical conclusion. Here's an interesting story of a secret Confederate message in a bottle being found and decoded nearly a century and a half after being written. We have to thank our friend Roy for this one. Posted on youtube by James Fariello. We would like to wish all of our readers and your families a Merry Christmas! Our source on this ongoing story has sent us a link to the story printed in the Philadelphia paper. I have copied the story from the web and have posted it below for our readers. In life, Edwin and John Wilkes Booth were brothers, ambitious actors, and bitter rivals. They ruthlessly competed for the limelight on stages in Philadelphia and across the nation. Edwin became one of America's greatest Shakespearean actors, while John Wilkes achieved infamy in another role - as the assassin of Abraham Lincoln, at Ford's Theater in Washington. By using DNA comparisons, relatives from the Philadelphia area, New Jersey, and Rhode Island hope to learn in the coming months whether the lore of John Wilkes Booth's flight is true. Is Lincoln's assassin in an unmarked grave at Green Mount Cemetery in Baltimore, as history records? Or did he elude justice, as descendants have been told for generations, to live 38 more years? "I'm absolutely in favor of exhuming Edwin," said Joanne Hulme, 60, a resident of the Kensington section of the city who is the historian in the Booth family. "Let's have the truth and put this thing to rest." "It's better to know," said her sister Suzanne Flaherty, 64, of Bordentown. The sisters, with a third sibling, Virginia Kline of Warminster, have wondered about Booth stories that don't match accepted history, as did their late mother. At 9 p.m. April 14, 1865, John Wilkes Booth, son of theatrical parents, walked into Taltavull's Star Saloon next to Ford's Theatre and asked for a bottle of whiskey and some water. "You'll never be the actor your father was," a customer reportedly told him. "When I leave the stage, I will be the most famous man in America," Booth fired back, according to accounts. An hour and a half later, the dark-haired actor - a matinee idol of his time - shot Lincoln in the State Box at Ford's and dropped about 11 feet to the stage, breaking his left leg. History says Booth was cornered 12 days later by detectives and Union soldiers in a tobacco barn at the Garrett farm in Port Royal, Va. Shortly after 2 a.m. on a cool and cloudy Wednesday, he was mortally wounded in the neck. Efforts by descendants to open the Baltimore grave believed to be John Wilkes Booth's were thwarted in 1995 by a judge who concluded its location could not be conclusively determined. The remains were supposed to be in the family plot, but reports placed it at an undisclosed location. The family had hoped to use the skull and photographic techniques, along with other identifying scars, to make an identification. Their best option now is to compare DNA from Edwin Booth, buried in Cambridge, Mass., with a specimen from the man shot at the barn, who experts agree is buried in Baltimore. Three cervical vertebrae from that body are in the collection of the National Museum of Health and Medicine in Washington. Philadelphia's Mutter Museum has cervical tissue from the man, but the DNA was degraded by formaldehyde and alcohol. The Booth escape "is a story that never seems to die," said Jan Herman, chief historian for the Navy Medical Department and special assistant to the Navy surgeon general in Washington. "I have always been disturbed by the opposition from recognized Civil War historians" to uncover the truth, he said. "We have the means, and it's certainly worth solving an age-old mystery. Why wouldn't you want to do that?" The questions over Booth's possible escape also have attracted the scrutiny of the History channel program Brad Meltzer's Decoded, which will air a one-hour segment at 10 p.m. Thursday that explores the evidence. "There are certain incidents in history that raise enough questions that they're worth looking at," said David McKillop, senior vice president of development and programming for History. Booth's possible escape "is a mystery." Probably no one wants to get to the bottom of it more than Nate Orlowek, a Maryland educator and historian who since age 15 has doggedly pursued Booth through the yellowing pages of books and period documents. "If the man who killed our greatest president got away and a giant hoax was perpetrated on the American people, then we should know about it," he said. Orlowek, 53, has trailed Booth through the reports of witnesses who claimed another man was shot at the farm: James William Boyd or John William Boyd, who bore a striking resemblance to the assassin and by some accounts was sought for the murder of a Union captain. He's followed the trail of carnivals that exhibited the mummified body of a man the barkers claimed was John Wilkes Booth. And he's sought clues from descendants and interviewed forensic pathologists, authors, and lawyers. His conclusion? Booth escaped 145 years ago to live in Granbury, Texas, as John St. Helen, then changed his name to David E. George and moved to what is now Enid, Okla. He worked there as an itinerant painter before poisoning himself. George's mummified remains were allegedly last seen at a carnival in New Hope in 1976. "Society exists based on the knowledge of itself and the truth of its history," Orlowek said. "We believe in getting the truth no matter what it is. . . .
"If we are proven right," he said, "history will be set on its ear. This will teach us that just because something was blindly accepted in the past, that it is not necessarily true." The Booth conundrum comes down to the DNA, say family members. 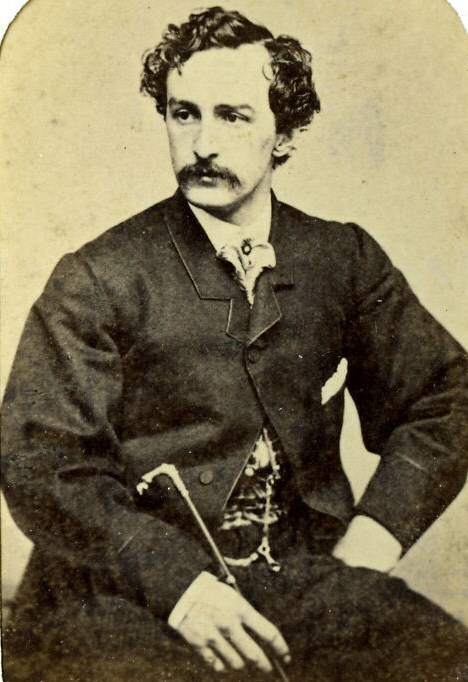 Once a sample is retrieved from Edwin Booth's body, the next obstacle would be obtaining a viable sample from a bone specimen believed to be John Wilkes Booth's, preserved in Lucite, at the National Museum of Health and Medicine. A panel judges such requests, based on their merits and social, legal, and ethical implications, officials said. "We do not approve destructive testing on nonrenewable historical artifacts," said Timothy Clarke Jr., a spokesman for the museum. Possible harm to the artifact must be weighed against the benefits of the testing, said Sharon A. Smith, president of the Civil War Museum of Philadelphia. "It's a question of preserving the physical evidence of history and not putting it at risk," said Smith, who believes the accepted version of what happened at the Garrett farm. "If the preponderance of evidence is that this is a myth, then should we be investing scarce historic resources?" Historians such as Herman, though, say the test "wouldn't destroy the sample." A tiny drill could extract what's needed. "If it compares favorably, that's the end of the controversy," Herman said. "That was Booth in the barn, end of case. "If it doesn't match, you change American history," he said. "Booth would have a fine time making headlines in the newspapers again. Someone else was shot" at the Garrett farm in that case, he said. Booth descendants "always refer to that man as the 'body in the barn,' never John Wilkes Booth," Hulme added. "If historians are so convinced they're right, let them prove it." The more I research Joe Hunter and J. Frank Dalton the more I realize that there is still information about these men out there waiting to be recovered. On a number of occasions I have heard of people having information only to find that they have sold it or gave it away. I thought I would use the networking power of the blog to find any information that still may be out there. I'm working on a couple of leads at the moment, but I'm always willing to chase down new ones. Thanks to our buddy Homer for getting this upadated information to me so I can post it for our readers. Once again, I would like to say this really annoys the crap out of me. This clearly shows that the U.S. government worked directly against a U.S. company and even went so far as to re-interpret a law just to screw over Odyssey Marine Exploration. PowerRating) a pioneer in the field of deep ocean exploration, was named in several U.S. State Department cables obtained by WikiLeaks and furnished to the media worldwide. Some of the released cables suggest that the State Department offered special assistance in the "Black Swan" case to Spanish officials in exchange for assistance in acquiring a French painting confiscated by the Nazis during World War II and now controlled by Spain. The cables indicate that the U.S. Government also provided confidential documentation on Odyssey to Spain. Other State Department cables contradict Spain's claims and support Odyssey's previously stated version of events relating to the company's activities in Spain, including the HMS Sussex project and the boarding of Odyssey's vessels. "While we are obviously concerned about these implications regarding the "Black Swan" case, we are attempting to obtain additional information before taking any specific actions. I have personally sent a letter to the Secretary of State, Hillary Rodham Clinton, requesting additional information and a review of the position taken by the U.S. in the 'Black Swan' legal case," stated Greg Stemm, Odyssey CEO. "The possibility that someone in the U.S. Government came up with this perfidious offer to sacrifice Odyssey, its thousands of shareholders, and the many jobs created by the company in exchange for the return of one painting to one individual is hard to believe. The WikiLeaks cables clearly show that we have worked cooperatively and transparently with both Spain and the State Department for many years, in spite of claims to the contrary. That fact makes the revelations all the more disappointing. The cables also make us wonder what other agreements may have taken place between U.S. Government officials and Spain regarding the amicus brief filed in support of Spain's position in the 'Black Swan' case." "We've wondered why the United States changed its long standing position on sovereign immunity, which prior to this case was consistent with U.S. law, international law and U.S. naval regulations that in order for a foreign country's ships and cargo to be immune from the jurisdiction of the U.S. courts they must be engaged in military, non-commercial activities," stated Melinda MacConnel, Odyssey Vice President and General Counsel. "These released cables do call into question the motivation behind the amicus brief filed by the Executive Branch supporting Spain in the 'Black Swan' case." Additional cables released support Odyssey's statements that, contrary to allegations of certain Spanish officials, the company always cooperated with the Spanish Government and that permits from the Spanish government were granted for work on the HMS Sussex project. The cables also demonstrate the obstructionist activities carried out by certain Spanish officials who had personal reasons for trying to prevent Odyssey from working on the Sussex. These obstructions took place even though Odyssey has an exclusive contract for the archaeological excavation of this UK sovereign immune warship (which was on a strictly military mission when it sank in 1694 off the coast of Gibraltar). Odyssey filed an affidavit in 2007 with a chronology of Odyssey's interactions with the Spanish Government since 1998. It can be accessed at http://shipwreck.net/pdf/ExhibitE.pdf. The document contains entries that are corroborated by information in the State Department cables, which directly contradict claims by some Spanish officials and the Spanish media. In May 2007, Odyssey announced the discovery of the "Black Swan," a Colonial-period site located in the Atlantic Ocean which yielded over 500,000 silver coins weighing more than 17 tons, hundreds of gold coins, worked gold, and other artifacts. Odyssey completed an extensive pre-disturbance survey of the "Black Swan" site, which included recording over 14,000 digital still images used to create a photomosaic of the site. The coins and artifacts were brought into the United States with a valid export license and imported legally pursuant to U.S. law. Odyssey brought the artifacts under the jurisdiction of the U.S. District Court by filing an Admiralty arrest action. This procedure allows any legitimate claimant with an interest in the property to make a claim. The Kingdom of Spain filed a claim to the treasure alleging that the coins originated from the Nuestra Senora de las Mercedes, a Spanish naval vessel which sunk in 1804. Spain claimed that it owned all of the coins and that the treasure was immune from the jurisdiction of the U.S. Court under the Foreign Sovereign Immunities Act (FSIA). Although it has not been conclusively proven the recovered cargo came from the Mercedes, Odyssey presented clear evidence to the trial court (including the ship's manifest) that shows the primary purpose of the Mercedes' last voyage was commercial in nature and the vast majority of coins on board were owned by private merchants, not by Spain. The United States filed an amicus brief in the case changing its previous position and supporting Spain in the "Black Swan" case by setting forth a re-interpretation of the language in the Sunken Military Craft Act (SMCA) to allow government owned vessels on commercial missions to enjoy sovereign immunity. A number of individual private descendants (whose ancestors were transporting goods on the Mercedes) as well as the country of Peru have filed claims in the case. Without conducting a hearing, the district court sided with Spain and ruled that the treasure should all be turned over to Spain. The case is currently on appeal at the Eleventh Circuit. For more information on the "Black Swan," visit www.shipwreck.net/blackswan.php. Odyssey's significant legal filings in the Black Swan case can be viewed at http://www.shipwreck.net/blackswanlegal.php. Odyssey Marine Exploration, Inc. (Nasdaq:OMEX) is engaged in the exploration of deep-ocean shipwrecks and uses innovative methods and state-of-the-art technology to conduct extensive search and archaeological recovery operations around the world. Odyssey discovered the Civil War era shipwreck of the SS Republic(R) in 2003 and recovered over 50,000 coins and 14,000 artifacts from the site nearly 1,700 feet deep. In May 2007, Odyssey announced the historic deep-ocean treasure recovery of over 500,000 silver and gold coins, weighing 17 tons, from a Colonial era site code-named "Black Swan." In February 2009, Odyssey announced the discovery of Balchin's HMS Victory. Odyssey also has other shipwreck projects in various stages of development around the world. Odyssey offers various ways to share in the excitement of deep-ocean exploration by making shipwreck treasures and artifacts available to collectors, the general public and students through its webstore, exhibits, books, television, merchandise, educational programs and virtual museum located at www.odysseysvirtualmuseum.com. Odyssey's operations are the subject of a Discovery Channel television series titled "Treasure Quest," produced by JWM Productions. The 12-episode first season aired worldwide in 2009. Following previous successful engagements in New Orleans, Tampa, Detroit, Oklahoma City and Charlotte, Odyssey's SHIPWRECK! Pirates & Treasure exhibit is currently on display at the Maryland Science Center in Baltimore. Additional information is available at http://www.mdsci.org/. For details on Odyssey's activities and its commitment to the preservation of maritime heritage please visit www.shipwreck.net. CONTACT: Odyssey Marine Exploration, Inc. So who says that you have to be near the coast to find a ship sunken by cannon fire? Well thanks to my partner in crime "Lefty", I came across this story of a sunken ship right here in our own wonderful state of Oklahoma. Now to weave this tale we have to start somewhere and that somewhere is on the banks of the Arkansas river June 15, 1864. The Union stern wheel steamer "J.R Williams", along with a guard of 25 men from the 12th Kansas Calvary Regiment and its crew, traveled the waters of the Arkansas river from Ft. Smith to Ft. Gibson in the Cherokee nation. Little did they know that on this ill-fated night that Col. Stand Watie's confederate Indian Brigade and a three-gun battery where waiting in ambush at Pheasant Bluff near the present day town of Tahmaha. The confederate artillery sent shells into the night ripping holes into the upper works and smokes stacks. Having several of its members on board killed the Steamer became grounded on the opposite bank from the battery of artillery. During this time the confederate troops boarded the steamer and manage to capture a few more union soldiers as other union soldiers escaped into the woods. Now sitting on the south side of the Arkansas River the confederate's unloaded as much booty as they could carry and set the Steamer adrift down stream. Now just so you know some of the cargo was 16,000`pounds of bacon, 150 barrels of flower, clothes, and other supplies needed to support a war effort. These things aren't high on a treasure hunters look list. How ever I think this would be a interesting site to find for the simple fact the site where the ambush took place could yield some great artifacts such as guns artillery rounds as well as if you could find anything of the steamer that might be left. There could even be some over looked loot or even some loot near by that was stashed by those who escaped. I have to close this by saying that thanks to my old friend "Lefty" and the fact that we both are always searching for the next great clue to treasure, we both read a lot and I'm sure our wives blame us both for our ever growing library. With that, if this story interest you or you want to find a civil war shipwreck near you please find yourself a copy of "Encyclopedia of Civil War Shipwrecks" by W. Craig Gaines. About a week and a half a go we put up an article about John Wilkes Booth concerning his death or alleged life after death. And I say "alleged" because it lies in the realm of conspiracy with no actual proof that he, like so many others of his time, actually didn't die when history says they did. One of our readers, thank you Rick, has let us know that the History Channel will be airing a show on this Thursday, 23 December, at 9:00 p.m. (I believe that is central time) that will be discussing Lincoln and his assassination and the death of John Wilkes Booth. The show's name is "Brad Meltzer's Decoded". I have seen this show a couple of times and it is a little interesting and worth watching. For the most part, the people involved seem to be intelligent and logical in their thinking which might not sit too well with the big conspiracy believers but it's worth a look at least once, just to see what you think. Just in case you are wondering, my personal opinion is Booth died when history says he did but I'm going to watch the show too, just to see what they come up with. My apologies to our buddy Homer on this one. He sent this and several related stories to me a week or so ago but we have been so busy in the field on our treasure sites that I haven’t had time to get the information posted for our other readers. Thanks to Homer and his time on the internet we now know that there are a few government conspiracy theories that are true. Before I give you the story I’m going to add my own two cents worth on this. You didn’t really think you would get away without me giving an opinion, did you? As far as the pin-head wikileaks guy goes, I have mixed feelings. I don’t know exactly how or where he got his info from but if someone gave it to him and he simply posted it then it would be my opinion that he is covered by the First Amendment. With that said, anyone that has any responsible bone in their body would understand that a government has to have secrets to properly protect it’s citizens and certain things aren’t for the consumption of the general populace. I dislike secrets as much as the next guy but for the most part, I don’t necessarily need to know who we are spying on or how we are doing it. In my opinion, because of some of the information this guy posted on his site, he is a moron and should be considered dangerous. What do we do with him? I don’t have a clue but as much as I hate to congratulate the guy, I almost have to for a portion of the information he did post. It seems good ole Uncle Sam is screwing his citizens, specifically treasure hunters, once again and using the cloak of secrecy do it with. Our government was/is supplying a foreign government confidential information on a US company and it’s activities. All for the sole purpose of brokering a deal for a single painting. I find this to be despicable, unconscionable and a criminal act. The individuals within our government that were/are involved with this should be fired and prosecuted, not to mentioned sued by the Odyssey Marine treasure hunting company for everything they have now and will have for the rest of their lives. Just in case you can’t tell, this aggravates the crap out of me! As treasure hunters the government has been giving us the short end of the stick for years and now you can’t even trust your own government to back you in court against a foreign government. Not only will they not back you up, they intentionally screw you just for their own gratification. OK, I have put my soap box away. Here is the story. TAMPA — Sunken treasure, WikiLeaks documents and a priceless French painting. Suddenly, a great deal of international drama has touched down in Tampa and reads like a diplomatic thriller — with half a billion dollars in gold at stake. For years, Tampa's Odyssey Marine treasure hunting company has been fighting with the Spanish government over a 17 tons of gold and silver coins that Odyssey discovered and brought up off the Atlantic Ocean floor. Now, it turns out, Spain has been getting secret help since 2007 from an unlikely source: The U.S. government. Among the thousands of documents released by WikiLeaks are several U.S. diplomatic cables describing how U.S. ambassadors were helping Spain in their cause — partly to help broker a deal to bring a famous painting in Spain to a U.S. citizen who claimed it was looted by the Nazis in World War II. Specifically the U.S. offered to provide confidential customs documents prepared by Odyssey that Spain in turn planned to use in court to fight the company. Odyssey officials are not pleased. "The cables seem to indicate that someone in the U.S. State Department has literally offered to sacrifice Odyssey and its thousands of shareholders along with the many jobs created by the company in exchange for the return of one painting to one U.S. Citizen," the company said in a statement to the Tribune. "It is hard to believe that this really happened. It sounds like something out of a Hollywood script." London's Guardian newspaper first reported the cables, as part of its ongoing digestion of thousands of documents released by WikiLeaks. The U.S. government has condemned the release and called for prosecution of WikiLeaks founders. The Spanish were cool to the idea of returning the painting, the cables show, but were grateful after Department of Homeland Security staff in the U.S. embassy in Madrid handed the Spanish customs import documents that Odyssey had filed when bringing the treasure to Tampa. "The information was confidential," the U.S. cable stated, "and to be used only for law enforcement purposes." The Spanish replied that they were "interested in obtaining the Odyssey customs information to provide to lawyers representing the [Government of Spain] in the Tampa Admiralty Court." Odyssey found the treasure in May 2007 and has since argued that the treasure was on board a Spanish commercial vessel. The ship sank in international waters, possibly in 1804 while carrying commercial goods from Peru, Odyssey says, and was thus fair game for any salvage company that found it. Odyssey is now locked in a protracted legal battle with Spain, which claims the treasure was on a military mission at the time, and thus Spanish property forever. A diplomatic cable a year later describes how the U.S. Ambassador to Spain, Eduardo Aguirre, suggested a deal. He met with Spanish Minister of Culture Cesar Antonio Molina on June 30, 2008, who told the U.S. Ambassador that they should meet over the issue of a claim by an American citizen, Claude Cassirer, to recover a painting by Camille Pissarro. Cassirer claims the Nazis in 1939 forced his grandmother to sell them the painting and it passed through several hands before ending up in a Spanish museum. "The [U.S.] ambassador noted also that while the Odyssey and Cassirer claim were on separate legal tracks," the cable states, "it was in both governments' interest to avail themselves of whatever margin for manouevre they had, consistent with their legal obligations, to resolve both matters in a way that favoured the bilateral relationship." The Spanish official replied, the cable says, that there were many steps required before any movement on the painting, but that he had recently flown to Washington, in part, to meet with lawyers that Spain retained in the Odyssey case. He expressed "indignation" after a CNN interview where Odyssey CEO Greg Stemm aimed to keep the treasure and return only items of archeological value. The treasure now sits in a vault warehouse in an undisclosed location. The legal case already went through federal court in Tampa, and now rests in the Eleventh Circuit Court of Appeals in Atlanta. However the case is decided, observers expect it to be appealed to the U.S. Supreme Court. Another two cents of my opinion, if I were Odyssey Marine I would move every bit of that half billion dollars worth of gold and silver to my own island somewhere and tell everybody, especially Uncle Sam, to kiss my . . This is from the web. I thought some of our readers might find this interesting since it is a actual code! Do Hidden Letters in Mona Lisa's Eyes Reveal a Real da Vinci Code? (Dec. 13) -- "Mona Lisa" -- that smile, those eyes, the mystery of her identity. And now, new clues emerge over what is perhaps the most famous painting in history. An Italian researcher claims the eyes of the enigmatic woman in Leonardo da Vinci's 16th-century masterpiece contain a secret code. Highly magnified images of the painting reportedly reveal tiny letters embedded into the "Mona Lisa's" eyes, reports the U.K.'s Guardian newspaper. "Invisible to the naked eye and painted in black on green-brown are the letters LV in her right pupil, obviously Leonardo's initials, but it is what is in her left pupil that is far more interesting," said Silvano Vinceti, chairman of Italy's National Committee for Cultural Heritage. "It is very difficult to make them out clearly, but they appear to be the letters CE, or it could be the letter B," Vinceti added. In what could be a chapter out of Dan Brown's book (and the 2006 film) "The Da Vinci Code," more mysterious letters and numbers are found on the "Mona Lisa." Vinceti believes these are deliberate hints as to the actual identity of the model who posed for da Vinci's masterpiece -- a mystery that has puzzled art historians for centuries. "Under the right-hand arch of the bridge seen in the background, Leonardo also painted 72 or L2, another possible clue," Vinceti said. "Two expert painters we consulted on this tell us that all these marks, painted using a tiny brush and a magnifying glass, cannot be an error." Earlier this year, French researchers, using X-ray technology, determined that da Vinci used as many as 30 layers of paint to achieve the subtle shadows and light on the beguiling Mona Lisa face. While that technology helped solve the mystery of how the "Mona Lisa" was created, her identity is an ongoing mystery, even though some historians are convinced she was Lisa Gherardini, the wife of a prominent merchant of Florence. Vinceti, who will offer his conclusions about this new research next month, said it all began after a colleague found a decades-old book that referred to the letters in "Mona Lisa's" eyes. "Leonardo was keen on symbols and codes to get messages across, and he wanted us to know the identity of the model using the eyes, which he believed were the door to the soul and a means for communication," Vinceti said. This is not to be confused with “Absolut”. One is to calm you’re nerves so you don’t bang you head against the wall and the other is something you don’t find very many of in treasure hunting. I have said it many times on a few of the forums and to hunters I meet in person but I will say it again; there are very few absolutes in treasure hunting. I am always hearing people say that things are a certain way and that there were rules about putting down treasure and hiding mines. Ain’t so I tell ya, it just ain’t so. When it comes to the outlaws and how they put down their treasures the way they did it was varied and mind-boggling. Even the same group of outlaws or an individual outlaw put down treasures in different ways and marked them in different ways. 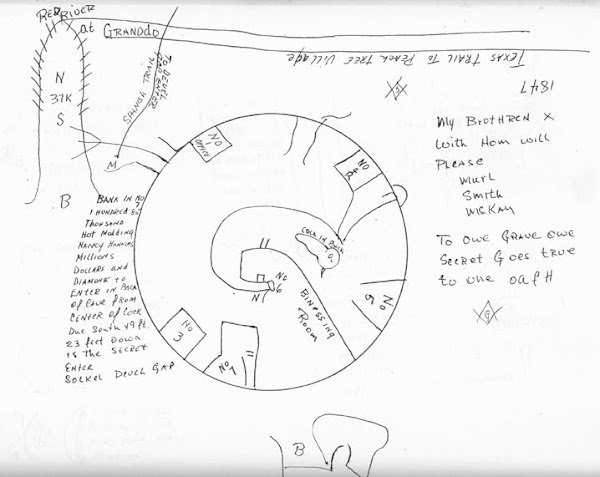 If you did a study of the treasure maps in existence known to have belonged to and been made by just Jesse James you will quickly see that he had several styles of maps. One may be a pictograph type map, another may have the terrain drawn on it with different spots marked and yet another may have an actual code on it that you have to decipher. Keep in mind there is a BIG difference between deciphering an actual code and interpreting symbols on a map. They are completely different in the way you approach them and solve them. This is where the big believers in the KGC mega-million dollar myths (which I am not one of) fall short on there theories. Thinking logically now, if you have a group of several individuals and they all need to be able to get back to the same spot by themselves then you have to have a code, an actual decipherable code, that anyone with the key can read. 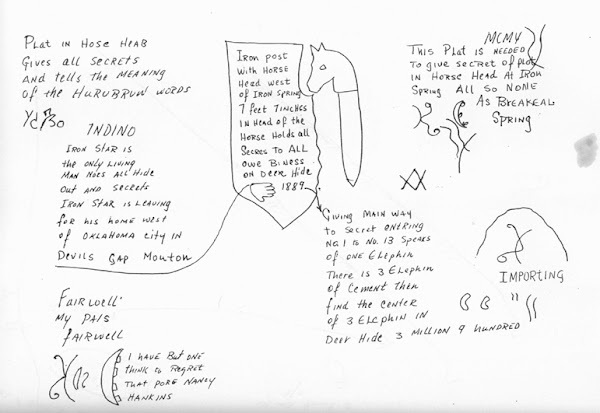 If the different individuals are wondering around the woods trying to interpret symbols on a map then they will very likely never find what they are looking for. This could be attested to by the late Frank James who spent many years trying to find all of the treasures Jesse had hidden. I would say that this is one of the very few absolutes in treasure hunting. If you have an organized group putting down several treasures then there has to be a way for all of the members with the proper authority to find the treasures. This is done with actual codes and not interpretation of symbols. If you are looking for Spanish treasure then you have the people that will tell you the King had rules about marking mines and treasure trails. This is somewhat true but not to the extent that everyone says. The Spanish traveled in groups and each group had it’s own way of marking things. This “way” may follow the general rules of the King but not be the same way that another group would mark a trail. How can this be you ask? The map makers had the power. They were the ones in each group that determined how something was marked and where. Each group had their own map maker and they took direction from him as to how and where to place a marker, carving or map. This means that although the general rule of the King may have been followed in that they marked the trail, the trail was marked based on how each individual map maker thought it should be marked, using his own style of markers and symbols. This is kind of like the current day politician who interprets a law so that it fits his needs the best. I can guarantee you that if you hunt enough Spanish trails you will see a pattern but rarely will anything be exactly the same. This is partly due to the map makers themselves and the rest to the terrain and what they had to work with at each site. There are sites where very specific measurements will come into play and there are others that are general in nature and will get you really close to the hole but not give you an exact spot. Pirates, Arggggggg! (I just can’t help myself) bootleggers and the like were more in line with the outlaws. They had more than one method of hiding and marking a treasure. A lot of their methods were based on the terrain around the treasure location. Don’t get me wrong here, if you are going to be successful at treasure hunting you need to learn as much as you can about your chosen line of treasure hunting. Each type of site, be it outlaw, Spanish, French, pirate Argggggg!, etc. will work a little to a whole lot differently than the other. I personally prefer to hunt outlaw and Spanish sites because I am more familiar with how they did things and let’s face it, there weren’t too many pirates sailing around the middle of Oklahoma! You have to keep in mind that for the most part, there were no rules. Everything will change some to a lot from site to site, even if it was the same group at each site. It’s a learning experience and eventually you will have the kind of knowledge that will help you move quickly (weeks instead of years) through a site to the end. Think logically, keep past experiences fresh in your mind and don’t be afraid to think outside of the box every once in a while. I also think you should keep the K.I.S.S. theory in mind. Usually, although it seems difficult at the time, a site turns out to be fairly simple once you get to the end and completely understand what was going on. This always helps you in the future. 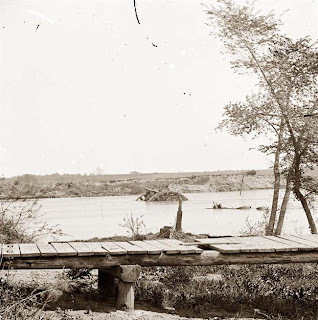 On May 11, 1865, at the close of the Civil War, a group of men traveling towards the war torn south stopped along Cow Creek in what is now Oklahoma. Weary of their long journey and concerned that their contraband cargo would be discovered by the occupying Federal troops﻿ they decided to bury their ill gotten loot before leaving Indian Territory. 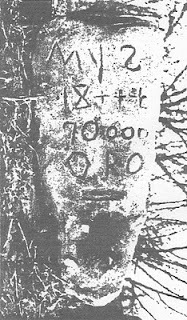 Near Cottonwood tank, twenty miles north of the Red River, they put $50,000 in a dinner pot and buried it 150 feet west of a big rock marked MYS. Another $160,000 was buried in other locations nearby, but the big prize are the 400 gold bars made by Moffat & Co. The collectors price on these today would far exceed the price of their gold content. Since I am still hunting this treasure myself, I won't give you a full account of the details concerning this story, but there are lead plates with inscribed instructions and a bit of mystery concerning their final resting place. Hopefully someday soon I can write the complete story for our readers to enjoy. Until then good luck and good hunting! What does John Wilkes Booth have to do with treasure you might ask? Well, there is a hidden treasure of a different sort waiting to be found by the persistent treasure hunter. This one isn't gold, silver, or rare jewels but items of historical value that would be worth more than their weight in gold. During the twelve day manhunt for Lincoln's killer, Booth and his accomplice hid themselves in a pine thicket for five of those days. It was during this period that the horses, that J. Wilkes Booth and David Herold had ridden to make their escape from Washington D.C. after the murder of President Lincoln, were put down. The horses were killed still wearing the saddles, bridles, and bits used during the daring get away. While the leather has more than likely rotted away, the metal parts should still be intact. These items would be of immense historical value! In a quicksand morass about a mile from the pine thicket lay the skeletons of the two slain horses. The question is where do you start searching? Well for our fellow treasure hunters in Maryland you can get a quick head start on the rest of us. The pine thicket was located about a mile west of Rich Hill which was the farm of Colonel Samuel Cox. With some internet searching I'm sure the farm and thicket can be located and a quick study of a topo map should narrow the search area down to manageable size. A quest of this sort might even be made into a History Channel show. Now for you KGC conspiracy guys who believe that Booth didn't die as history records, but was killed Jan. 14th 1903 in Enid Oklahoma by none other than Jesse James aka J. Frank Dalton. I suggest you you read Manhunt by James L. Swanson. After reading this very well researched and written book I think you will come to the conclusion that Booth really did die as history says. The death of David E. George who was the Booth impostor who committed suicide in Enid in 1903 was colorfully woven into one of the many lies that Orvus Lee Houk told during his many years as a Dalton promoter. I would be happy to help anyone interested in searching for the remains of the horses to narrow down the search area. I haven't taken the time to look for it myself, but I would enjoy the challenge. The exact spot Booth hid out in the pine thicket would also be a good spot to search. This could also be narrowed down to within 50 yards or so just from clues found in the book.